More information and links on the Rehabilitation of Offenders Act can be found in the dedicated information page we have. This detailed guide builds on a simple guide we have published on the Act as it now stands. We have also produced a poster which covers the main rehabilitation periods. The focus of this particular guide is on some of the more detailed and technical aspects of the Act, since it was amended with effect from the 10th March 2014. The Rehabilitation of Offenders Act 1974 (ROA) gives people with spent convictions and cautions the right not to disclose them when applying for most jobs, and for other products/services like when buying insurance. Apart from those given prison sentences of more than 4 years, most people with convictions will benefit from it at some point in their lives. In 2014, changes were made to the ROA. These changes mean that, for many people, the length of time you’ll need to disclose your convictions has been reduced. Knowing when your conviction is spent reduces the chances of your disclosing something which legally, you have no requirement to do. This detailed guide has been put together based on our best understanding of the law as it now stands. We will be looking to provide regular updates based on the areas that we are continuing to seek more clarity on, and in response to the queries and feedback that we receive through our Helpline. Throughout this guide, we try to use examples to help explain the points being made. The examples we provide in this guide are all based on somebody over 18 at the time of conviction/disposal, unless otherwise stated. This guide focuses on the more detailed and technical aspects of the Act as it now stands. However, to try and keep it as brief as possible, we haven’t covered all of the related areas to the Act that remain unchanged by the 2014 reforms. Please note – depending on the nature of the work, it might mean that some of the roles above will be entitled to know about spent convictions. If an organisation asks about all convictions, you should check what level of disclosure they’re entitled to, and if it’s only a basic DBS disclosure, you can legally withhold any spent convictions. We have detailed information on eligibility that might be helpful with this. Common jobs and roles where spent convictions will normally need to be disclosed are covered later in this guide. Once your convictions are spent, the Act gives you the right not to disclose them when applying for insurance. For example, spent motoring convictions do not need to be disclosed when applying for car insurance. This applies no matter what question an insurance company asks. Most will only ask for unspent convictions, although some might ask for ‘any convictions in the last 5 years’. If it’s spent, you do not need to disclose it under any circumstances when applying for insurance. We have more detailed information on insurance available here. The ROA only applies in England & Wales. Scotland and Northern Ireland have their own versions of the legislation, but they differ in a number of important respects. At the time of writing, the Scottish Government are actively consulting on making changes to Scottish disclosure legislation. To decide which laws you’re covered by, you have to ask yourself what you’re looking to do. If you’re applying for a job, you will normally be covered by the disclosure laws that apply to where the job is based. This will normally be obvious. However, this isn’t always the case. If you work for a large English-based company, but your base is in Edinburgh, you might think that you’re covered by Scottish law, because that is where you work. However, your contract of employment might say that you’re subject to English law. It’s quite common for employees to have contracts of employment governed by, for example, the laws of England and Wales but for their place of employment to be in another jurisdiction, e.g. Scotland. This can often be the case if you’re a seconded employee, or if you’re posted abroad after initially working for an employer in England. Normally, this means that all contractual disputes will be honoured in accordance with the laws of England and Wales. However, if you’re spending the majority of your physical time working outside of England and Wales it is likely that you will be covered by the relevant legislation in the country/jurisdiction they are working in, regardless of what your contract of employment says. If you are applying to work in Scotland under a contract of employment governed by English law, an employer is likely to be bound by the obligations of the law of Scotland by virtue of you working there. If you’re applying for home insurance, you will be covered by the disclosure laws that apply to your home address. These are important questions when looking to get a basic DBS disclosure. See later in this guide. The changes brought in on the 10th March 2014 mean that, for most people with unspent convictions, the length of time it takes for the convictions to become spent is reduced. It also means that some convictions that were previously never spent will now be able to become spent. This guide will explain these in more detail, and our online tool, www.disclosurecalculator.org.uk, has also been updated. 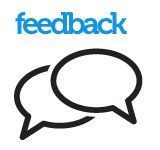 As a result, if you received any of the above sentences before 10th March 2014, alongside checking against this guide, you might also want to check our guidance on the old ROA (which is still available), as well as use the old version of our Disclosure Calculator (which is also still available). If they were regarded as spent before 10th March 2014, even if they would now be regarded as unspent under the new law, you’re allowed to treat them as spent convictions. Each sentence has a ‘rehabilitation period’. During the rehabilitation period, the conviction linked with that sentence is ‘unspent’. Once the ‘rehabilitation period’ has passed (and subject to any further convictions) the conviction becomes spent. If you committed an offence in 2002 but were not convicted until 2010, the ‘rehabilitation period’ would run from 2010. The rehabilitation period depends on the sentence you were given, not the type of offence that was committed. Below are some simple tables that we have produced. These are explained in more detail in our long list of rehabilitation periods. The Act applies to everyone convicted of a criminal offence in a civilian court. It also applies to service disciplinary offences (e.g. absence without leave) dealt with by a Service Court or the Commanding Officer. A fine imposed by a Magistrates’ Court and a fine imposed by a Court Martial would each have the same rehabilitation period of a year beginning with the date of conviction. Where there are civilian equivalents to a service offence, the same rehabilitation period will apply as if it were a civilian offence. There are also specific rehabilitation periods for military sentences. All other sentences particular to the service justice system (for example a severe reprimand or a service supervision and punishment order) that are not listed elsewhere in the guidance are spent immediately. Removal from Her Majesty’s services includes examples such as cashiering, discharge with ignominy, dismissal with disgrace or dismissal. Other military disposals particular to the service justice system includes examples such as severe reprimand or a service supervision and punishment order. Sexual offences per se are covered by the ROA in the same way as any other offence. 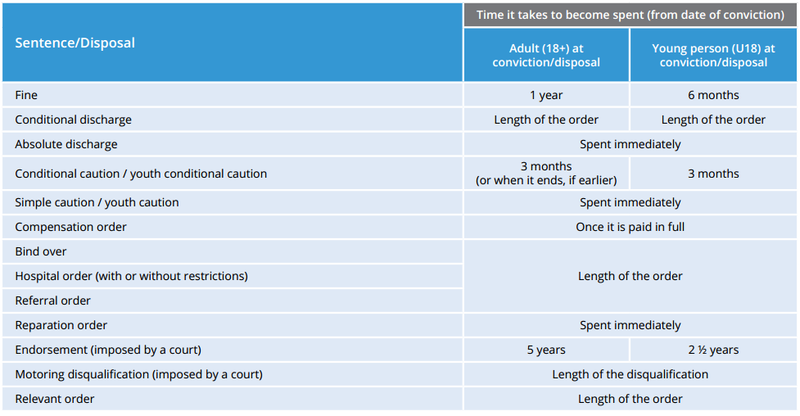 The length of time somebody is subject to the sexual offence notification requirements does not directly impact on the length of time it takes for a conviction to become spent. This does not constitute “any disqualification, disability, prohibition or other penalty” and so does not effect when a conviction becomes spent. However, some people who are convicted of a sexual offence may also be given a Sexual Offence Prevention Order (SOPO). The view of the Ministry of Justice is that SOPO falls within the definition in the ROA of an “order that imposes a prohibition”, so the rehabilitation period ends on the date when the prohibition ceases to have effect. This will depend on the length of the SOPO. This means that a conviction cannot become spent until the SOPO that relates to that conviction ends. It follows that if a SOPO is imposed for an indefinite period then it will be subject to disclosure indefinitely, until the SOPO is ended in some other way (e.g. going back to court to get the end date amended). Find out more about SOPO’s. In May 2015 SOPO’s were replaced by Sexual Harm Prevention Order’s (SHPO’s). If somebody is included in one of the ‘barred lists’ maintained by the DBS (which might get disclosed on an enhanced check), this is separate to how long it takes for that conviction to become spent and therefore not disclosed on a basic disclosure. Motoring offences are covered in a specific page here. We’ve put together a list of sentences/disposals with details of the length of time it takes for them to become spent under the ROA. Where you receive multiple sentences for a particular conviction, the sentence with the longest rehabilitation period will apply. If you get a fine and a 2 year community order, it will become spent 1 year after the community order ends. If you get a motoring conviction which results in a 6 month driving disqualification and an endorsement on your licence, it will become spent after 5 years. If you receive more than one sentence at the same time, the total rehabilitation period will depend on whether the sentences run concurrently (at the same time) or consecutively (one after the other). If concurrent sentences are imposed, then the longest applicable rehabilitation period will apply to all the sentences. If you received a four month and six month prison sentence ordered to run concurrently, this will count as a single term of six months (carrying a “buffer period” of two years from the end of the sentence, giving a total rehabilitation period of two years and 6 months before both convictions can be considered spent). If consecutive sentences are imposed, then the sentences will be added together to calculate the rehabilitation period. If you receive a four month and six month prison sentence running consecutively, this will count as a ten month sentence (carrying a “buffer period” of four years from the end of the sentence, giving a total rehabilitation period of four years and ten months before the convictions can be considered spent). Prison sentences that are ordered to run consecutively to sentences already being served are not affected by this rule. If the later outcome is a caution (either a simple caution or a conditional caution), neither rehabilitation period will be affected. They run separately. If the later outcome is a conviction, then neither conviction will become spent until the rehabilitation periods for both convictions are over.There are limited exceptions to this where the original conviction only has a disqualification, disability, prohibition or other penalty which means that it becomes spent once it no longer has effect. For example, it is possible to be sentenced to disqualification from driving as the only sentence. If this was a further conviction, it would not impact on the rehabilitation period for the first offence. However, if the second conviction resulted not only in a disqualification, but also to another sentence with a rehabilitation period (e.g. an endorsement), then the second conviction may impact on the rehabilitation period for the first offence. These circumstances are very limited as there will be few occasions when a conviction only results in a disqualification, for example, but it is possible. If the further conviction results in a prison sentence of more than 4 years, then neither the second nor the first conviction will ever become spent. Once a conviction becomes spent, it remains spent, even if you’re convicted again in the future. If you get another conditional caution or conviction before the first conditional caution becomes spent, it depends on whether it was related to the original offence. If the later conditional caution or conviction is separate (i.e. not for the offence that you were cautioned for) then neither rehabilitation period will be affected. The conditional caution will become spent at the end of 3 months from when it was given, and the caution or conviction for the later offence will become spent after the normal period. If you receive a 3 month conditional caution for shoplifting, and a month later receive a conviction for a separate offence, the conditional caution will become spent in the normal way (three months from the date of issue). In relation to the conviction for the separate offence, the rehabilitation period will apply for the sentence imposed by the court. However, if you fail to comply with a conditional caution, and you are subsequently prosecuted the conditional caution will cease to have effect. Any subsequent conviction will then attract the relevant rehabilitation period for the sentence imposed by the court. You receive a conditional caution for shoplifting and you fail to comply with the conditions and as a result are prosecuted for, and convicted of, the shoplifting offence for which he receives a fine, The conditional caution ceased to have effect when you were prosecuted and you now have a conviction with a 12 month rehabilitation period because of the fine. If you only have one conviction, it should be relatively straight-forward to establish whether your conviction if spent by using the tables in this guide. There’s also help on the internet. You can use our online calculator which will help you to work it out. This has been updated to reflect the new laws. Visit www.disclosurecalculator.org.uk. If you’re on Probation, you may be able to get help from them. If you’re unemployed, you may be able to access help through the Job Centre. You can also contact our helpline for advice. You can obtain a list of your unspent convictions by applying for a basic DBS disclosure from the Disclosure and Barring Service. The current cost is £25. Visit www.disclosurescotland.co.uk to do this. An employer may carry out a basic DBS disclosure as part of their recruitment process. It is only accurate at the time you apply, it cannot be backdated and will not show convictions that are spent. Which disclosure laws you should get the disclosure issued under, depends on why you’re applying for a basic DBS disclosure. As a matter of process, the Disclosure and Barring Service will assume that you want the disclosure issued in line with the laws that apply to your home address. If you live in Newcastle, they’ll issue the disclosure under English law, unless you request otherwise. You should ask yourself why you need the disclosure before deciding what disclosure laws you want the check to be issued under. See ‘What countries does it cover’ earlier in this guide for further information. If you’re applying for jobs that disclose all convictions (including spent ones), it’s really important to find out exactly what your criminal record is so that you know what you do and don’t have to disclose. To do this, one option is to get a copy of your police records. Under the Data Protection Act, you can apply for a Subject Access Request from your local police force. This costs £10, and provides information that is held on the Police National Computer (PNC) about you (not just your unspent convictions). The Rehabilitation of Offenders Act only covers certain things. There are a number of important areas of life where the Act does not apply. The main ones are listed below. There are many jobs where you might need to disclose your spent convictions. These are normally where a standard or enhanced criminal record check can be carried out, and where both unspent and spent convictions and cautions will be disclosed. The only exception to this is where a conviction or caution is eligible to be filtered – click here for more information on filtering. There is more detailed guidance on eligibility for criminal record checks here. Travelling to the UK, when applying for a visa to stay in the UK, or when applying for citizenship, spent convictions can be taken into account. There is detailed guidance available which covers travelling to the UK and applying for citizenship. Although spent convictions can be taken into account, there are guidelines on how spent convictions are dealt with. The Act only applies to England & Wales. This means that, when travelling to another country, you have to look at what processes that country has in place to deal with individuals who have convictions. Very often, they will have their own guidelines, which you should look at and apply to your situation. On our Information Hub, we cover a number of specific countries, including the US, Canada, Australia and New Zealand. If asked, you will have to disclose the when applying for products and services, such as insurance, a mortgage or renting a house. For some jobs (those exempt from the ROA), you will need to disclose them if asked – these jobs will usually involve a standard or enhanced criminal record check, so even if they don’t ask, if they are doing one of these, you should disclose. They will still be disclosed on standard and enhanced criminal record checks (unless filtered), and for positions that are eligible for standard or enhanced checks, employers can legally refuse you or discriminate against you. Through the work that we do, we often come across common mistakes that people make when trying to understanding the Act. Some of these mistakes, and the associated facts, are detailed below. Fact – A suspended sentence is treated in the same way as a prison sentence when determining the rehabilitation period. Fact – The rehabilitation period is decided by using the sentence imposed at court, rather than the time served in custody. Fact – Most community orders will have a date set by the court when they end. This will usually be for longer than it takes to complete your unpaid work. Fact – A fine for an endorsable motoring offence will normally result in an endorsement on your licence, which means it’ll take 5 years to become spent. Fact – Sexual offences can be become spent, so long as a conviction didn’t result in more than 4 years in prison. The rehabilitation period depends on the sentence you were given, not the offence that was committed. The rehabilitation period is decided by using the sentence imposed at court, rather than the time served in custody. If you received an 8 month sentence, but were released after 4 months, your rehabilitation period would be based on the 8 month sentence. The ‘buffer’ part of the rehabilitation period starts from the end of the full sentence. The date that you are released is irrelevant. If you were sentenced to 2 years in June 2013 and are released in June 2014, the ‘buffer’ period of 4 years doesn’t start until June 2015, so the conviction would become spent in June 2019. The way in which these ‘ancillary orders’ (as they’re known) are impacting on how long it takes for a conviction to become spent is something that we’re collecting evidence about at the moment. If you have a copy of your basic DBS disclosure which shows that your conviction is still unspent because of a court order, please send us copies, as we’re keen to understand what types of orders this is affecting – email them to policy@unlock.org.uk. If you are given a probation or conditional discharge order and are later back in court for a breach of that order, this can affect the rehabilitation period applicable to the original conviction. If the court imposes a further sentence when it deals with the breach, then the original conviction will run on until both rehabilitation periods have expired. A conviction for the purposes of the ROA includes a conviction issued outside of England and Wales and therefore convictions issued abroad are eligible to receive the protection of the ROA whilst you are in England & Wales. If you were convicted in Italy in June 2013 and given a fine, this would be spent in England & Wales in June 2014. There can sometimes be confusion where the sentence given abroad doesn’t match with those in the ROA. Where the sentence does not match one of those contained in the Act, you should try to find a sentence which is the nearest equivalent. If you check your police record, this may help you to see how it has been recorded on the Police National Computer (if at all), as this is what will be used when getting the data to go onto a basic DBS disclosure. The organisation that looks after the translation of overseas convictions onto the PNC is the UK Central Authority. If you have any queries, you can call them on 0207 0354040 or write to UK Central Authority, Judicial cooperation unit, 5th floor Fry Building, 2 Marsham Street, London, SW1P 4DF. For a range of frequently asked questions about the Rehabilitation of Offenders Act, click here.